Guests coming to the park may also want to spend some time at the beach. Create an access route to the beach that leads from the parking lot, down to the beach. 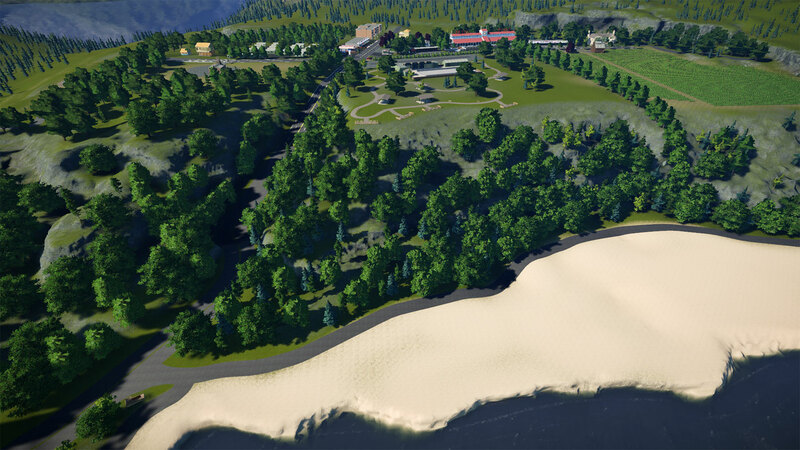 Add a second entrance to your park from the beach side, so guests at the park can have easy access to the beach, and lake visitors can enter the park without having to drive up to the front lot. While you're at it, fix up the beach a little. You can add beach chairs, beach activities, vendors, even a small boardwalk...it's up to you. Continue to expand your park with at least one new flat ride or tracked ride. If you have time, you can add more. You must not expand past the ice rink plot of land. The deadline to complete this challenge is midnight on Tuesday, July 17th. The maximum allowed number of screenshots is 6. Woah! Now thits a unique challenge! Love it! Can I ask a favour that you bullet points the requirements for me, struggling to hold the information as I read it. Yipes. I saw that possibility coming, but did not expect it this soon. I've got so much to do that I may not need Old Man Jenkins to die anymore. Just to be clear, we are NOT supposed to use the scenario editor to add a 2nd peep spawner by the lake, correct? Just connect the lake both to the back of the existing park and also separately to the parking lot? Thank you so much ShyGuy much easier to take in! No, you're not supposed to create a 2nd peep spawner. But you may if you like. The point is so peeps can access the beach from the top without paying admission to the park. A second back entrance to the park needs to be added so that peeps who are at the park, can access the beach easily. (They'll of course need a hand stamp to get back in the park. Also, I added that you must still stay within the boundary of the ice rink plot. Great challenge, but point 2 has confused me a bit. The assumption is that the access route from our existing parking lot is pedestrian only? Is that correct? Or do we need to build a new road to the beach? The reason I ask is that you mention lake visitors not having to *drive* back up to the main parking lot. Does this mean the new entrance on the beach side has to be accessible by car? Sorry for the confusion. No. The new entrance is for pedestrians hiking up from the beach via the new accessway that you will build. The type and style of this accessway is up to you, but it is for pedestrian traffic only. Thanks Shy. Presumably, given you mention a boardwalk as one suggestion, we will be permitted (or encouraged) to use the new DLC that arrives with us on Tuesday, but will not be penalised for not purchasing/using it? Well, we have a legal issue here. The section of beach at the back of the farm parcel has already been developed and there's an access road to this area running across the back of the ice rink parcel. Because there's no other access to the farm's beach area, this road constitutes an easement across the ice rink property. We can't get rid of this road without providing Farmer Jenkins an alternative route to the back of his property. Which would be another easement on the ice rink parcel. 1. We buy the beach section of Farm Jenkin's property. This eliminates the need for an easement because we would then own all that beach. 2. We pay Farmer Jenkins enough that he'll sell us the easement and have enough left over to build his own road to the front of his property. Either way requires some changes to the farm parcel. What's the solution? Since your knowledge of legal procedings is far greater than mine, I leave that decision up to you. Objectives 1 and 2 are completely separate objectives. 1. If everyone else agrees...I would say the road on the church property side can be used (the road is public domain???) as the access road down to the beach and can be used and spruced up so it will be a 'true' purpose for this access. Remember this is for easy beach access if they don't want to go through the actual park. 2. This is a true park entry from the beach side. like what you put up by the parking lot. This allows those in the park easy walking access to the beach area, and those that are on the beach (say they were dropped off from the access road in number one...or maybe were dropped of by a boat from the lake) easy access to the park without going all the way up to the parking lot side for that access. Correct me if im wrong, but I interpreted the concept for bullet #1 is to provide a non-park pedestrian route to the beach.. The road between the ice rink & church plots has no sidewalks, 4 lanes of high speed traffic, and poor visibility due to overgrown conditions. It is a very dangerous place for pedestrians to walk. This pathway would effectively be a concession that the park made to the city for the privilege of having a park there. (similar to how irl hotels near beaches are required to provide right of ways through their properties so that the general public can access the beach.). Again, I may be totally off base, but that is how i interpreted it. Bullet #2 is to provide a park entrance at the beach so that peeps can easily spend part of the day at the beach then conveniently spend the rest of the day at the park (without requiring a huge trek up to the parking lot).. Effectively, I interpreted it as 2 completely separate pathways to the beach. 1 public & 1 through the park. May be totally wrong though. I'm sure we're all overthinking this, but the only new path I'm interpreting is what's needed to connect the park to the beach. I think Shy wants to see what we'll do to navigate peeps up and down that hill. I suppose sidewalks along the streets wouldn't hurt, but I feel like that's the city's problem. Plus, maybe Old Man Jenkins will get hit by a bus while trying to chase down a cow or something. There are no restrictions on the use of DLC packs. And as far as judging goes, there are no advantages to using it as well. So, you know when you have an idea, start building something, and wonder why the hell you attempted it? I really hope most all you competitors invest in the new DLC as I think it can make this competition really interesting. Some of the streams showing up today are making it look really good. Hi all! I'm fairly new to the game and just found this forum. Is it still possible to join in? I know I wouldn't get points for the first challenge, and that's ok with me. Shyguy, could I please request a rule from this point on that no filters should be used for screenshots? I have the Vintage DLC, but others that don’t shouldn’t be negatively impacted by only having the natural screenshots available, IMO. I think it’s as bad as photoshopping, as it doesn’t necessarily give a representative view of the park. By all means I think we should be able to do sunset/night images, but not filters. Just a thought. Your call! Sure, the more the merrier. And it will make up for those who already dropped out before the 1st challenge. Absolutely. No filters and only very minor Photoshopping allowed. Could you clarify very minor photoshopping please? Would something like superimposing a real sky count as major? Minor would be adjusting brightness/contrast, sharpness, minor color enhancement...that sort of thing. No skies. Quick query - are you happy to just see the new flat/tracked ride in the background of another shot that is highlighting hopefully more interesting construction on the beach, the new entrance etc? I'm not sure I want to "waste" one of my six screenshots on a close up of a flat ride, when I can be showing off some more interesting builds, but am happy to feature them in an aerial overview shot as part of my six.